Were you looking for some mango salsa recipes? I’ve got a couple of recipes that are refreshingly delicious, perfect for the up and coming summer months. If this is your first experience trying mango salsa recipes, your taste buds are in for a treat. You are going to think you are on a tropical island enjoying an exquisite dining experience. The combination of sweet mangos mixed with jalapeno heat is a combination of flavors not to be missed. And of course you can adjust the heat to your liking. Not only are mangos delicious, they are healthy too. They are rich in Vitamins A, C and potassium and contain up to 40% of your daily fiber requirements. All this in one average size mango. Did you know that mangos make a great tenderizer to add to your marinades too? Mangos contain an enzyme that is beneficial in two ways. It aids in tenderizing meats. This enzyme has soothing properties and acts as a digestive aid making us feel better. Now that you are ready to try some mango salsa, you may be wondering how to pick a ripe mango. You can usually tell by smelling and squeezing. Want to use that mango today? With a ripe mango you will notice a sweet tropical aroma coming from the stem end. Upon squeezing, the fruit will yield to slight pressure, somewhat like an avocado. Ripe mangos are usually yellow/orange in color. If you are not going to use the mango for a few days, look for a firmer mango with a tight skin. After you bring your mangos home from the store, you can ripen them right on your kitchen counter, just keep them out of the sun. An unripe mango will not ripen in the refrigerator. If you need them in a hurry, put them in a paper bag with an apple which will speed up the ripening process. Once ripe you can store them in the refrigerator. Peel the mango first. I like using a knife as a potato peeler doesn’t work well on a ripe mango. Once peeled, cut off the two widest sides of the flesh (called the cheeks), keeping your knife close to the seed. Then dice each half to the desired size. Add all of the above to a medium sized bowl and mix with a spoon. Chill in the refrigerator for 1 hour before serving. Whip up some margaritas and serve your tropical mango salsa recipes with my favorite organic white corn chips from Trader Joe’s and you’ve got the beginnings of a Mexican fiesta. Finish off with some guacamole, chicken enchiladas and frijoles for dinner and flan for dessert. Ole! 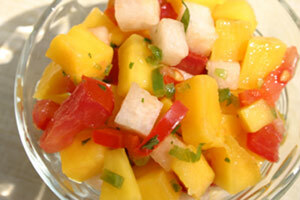 Fresh mango salsa is also great with fish or chicken too. Makes about 5 cups. Enough for that party! Here is the second of my mango salsa recipes you are sure to enjoy. The addition of avocado adds a creamy delectable flavor that goes well with mango. Mix all ingredients except avocado in large bowl. Add avocado to salsa and stir gently to combine.